Piriformis Syndrome is a common disorder caused by compression to the sciatic nerve by the Piriformis muscle. Manifestations are pain, tingling and numbness in the buttocks and along the path of the sciatic nerve`s descend. 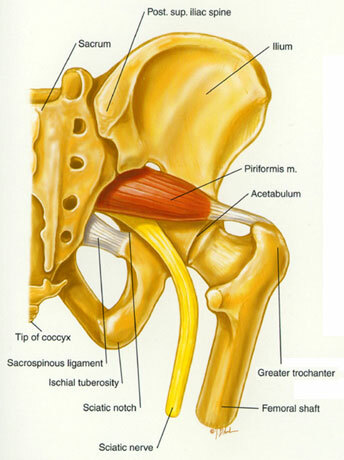 But what is Piriformis muscle? 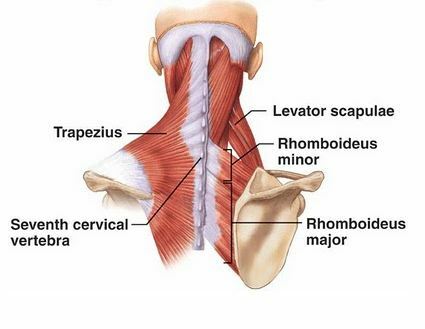 It`s a flat, pyramidal shaped muscle, located in the pelvis region. Its function is to rotate the hip, along with several other muscles. The sciatic nerve passes through piriformis muscle, separating it in two. It is possible that trauma, hemorrhage , or spasm of the muscle can lead to Piriformis Syndrome. Along with general information about piriformis syndrome itself, today we will be discussing it`s symptoms and offer you a full resource of 35 best exercises which will help you alleviate the pain. This specific condition can be somewhat elusive, so it is often overlooked but can also be over-diagnosed. From my experience, reasons can be inconsistent description in literature or a simple oversight due to the rareness of the condition itself. This syndrome can be caused by overuse of the Piriformis muscle or some sort of repetitive trauma. Acute trauma is often associated with Piriformis syndrome, a strong blow to the buttocks region can cause hematoma and scarring of the surrounding muscles, affecting sciatic nerve leading to this disorder. I can add congenital factors to the “causes” list. In certain cases, there is an anatomical, anomaly in relations of the sciatic nerve and piriformis muscle, that can set this syndrome in motion. Indications of the already present syndrome are pain, in the buttocks, posterior portion of the upper, and sometimes, lower part of the leg. The pain increases as the person performs physical activity, such as sports, riding bicycle, walking for long periods of time, swimming etc. As I’m sure you already know, pain is ever present. But pain as such can be associated with many other conditions so we have to be more specific about its origin, location, duration and some other aspects. One of the more common symptoms associated with Piriformis muscle syndrome is pain that presents itself after person stands for 20 minutes or more, sits or even is lying down without changing position. After those 20, or in some cases 30, minutes person starts to complain about the radiating pain in their buttocks area (and we know that that is the place where the muscle is located). Pain will often spread to the sacrum and descend down, to the posterior side of the thigh, usually stopping somewhere close to the knee area. In most cases, pain will actually get worse when sufferers retain their position, and they will feel better if they engage in a light walk. But remember that energetic walk, rapid and forced movement can also do you harm so just take it easy. Movement is not the only thing that can worsen the pain, getting up and sitting back down can be very uncomfortable and painful, so I would advise you to get some assistance (you can use some apparatus or ask a family member, friend etc). Various difficulties during walking can occur, such as foot drop or antalgic gait. Antalgic gait is a form of gait abnormality where the stance phase of gait is abnormally shortened relative to the swing phase. Numbness of the foot can also be present. accompanied by sacroiliac pain. Pain that usually does not go away completely when changing positions. Alongside with the pain, people often experience tingling feeling and muscle weakness. You can perform a piriformis syndrome test yourself easily and identify the weakness, you just need a partner (you can grab a friend or a family member). You can do it like this: lie down to the side (choose one, it does not matter wich side you decide to start with) and have your friend push down on your leg while you try to resist him/her. Now do the same, but lying on your opposite hip. If you feel any weakness in your legs with regards to each other there is a good chance you have a problem with your piriform muscle. Aside from the pain in your lower back and extremity, a headache can be present as another symptom. You may also get neck pain, I know that headache and neck pain are pretty common for loads of conditions but when you combine them with all the above symptoms you will get a complete picture. So all this being said, Piriformis syndrome is a serious disorder that can affect the quality of your life, so my advice to you is this – if you notice some of these symptoms or feel like something is wrong go see a doctor, you have nothing to lose. If you feel pain while doing your usual, daily activity pay a visit to your doctor. It may be nothing, but if you feel something is wrong go with your gut. I`ve seen many people, sick or hurting, that refuse to go to the hospital. And i always tell them the same – Do not take your health for granted! We are fragile, and our bodies need constant care and attention especially when we are dealing with some abnormal processes, preventing our body to function properly. Doctors can often prescribe certain anti-inflammatory medication along with physical therapy and deep massage. So what to do when the pain starts? As I`m sure you will agree, ice comes to mind first. And it`s not a surprise, ice will help cool down inflammatory process (if it is present) and help relax your muscle. It is not a bad idea to lay down in a comfortable position and place the ice on the painful area. But if you don`t like cold, you might find heat to be more suitable. You can also incorporate a gentle or deep massage, depending on your preference. massage never hurt anyone and is especially effective with all back pain problems, including Piriformis syndrome. Another common way to fight pain on your own is stretching. If you are an athlete then you know the importance of stretching, and if you are not- you will quickly find out! Stretching, and movement in general is, according to the latest research, healthiest “thing” we can do for our body. World health organization actually says that insufficient movement is the number one threat to the people`s health, ahead of alcohol and cigarettes! That is a mind-blowing information, least for me. Insufficient movement weakens the heart and blood vessels and reduces hormone production. Movement is the single most efficient stimulant for the proper functioning of our body. And movement will strengthen your muscles and aid you in your fight against this syndrome. But don`t forget to stretch, stretch when you get up when you go to bed, before any physical activity and after, it will only do you good. I advise you to use movement to you advantage but not just any movement. It is advised that you consult your chiropractor and develop a whole set or plan of exercises and movement patterns. They must be controlled, because when such a delicate condition is diagnosed, you must be careful and not risk worsening your condition. So always listen to your doctor, and pay attention to what he/she is saying. As far as the medications go, there is no one specific drug that will make Piriformis syndrome go away. If you are still “getting acquainted” with the syndrome exercises and stretches it is best to start slow so you don’t push your muscles over their limit because you might do more damage than good. One more reason to start slow is the pain itself. If you have Piriformis syndrome, your muscle is rigid and stretching it will be painful, so if you start off too aggressively you will just aggravate it more and injure yourself further. NOTE: I am going to place a small comment in red at the end of each exercise to let you know if the exercise was challenging for me ( I am a healthy, adult male) so you can gain some perspective and see if the exercise will be challenging for you as well. First of all you need to find a clean, flat surface to lay down on (it can be your floor, bed etc.). Lay down with your legs flexed in the knees, with your feet flat on the ground. Cross your legs so your ankle is placed on the opposite leg`s knee. Now, place your hand on the knee of the crossed leg and push it away from you. As you push the knee away from you, you will feel the stretch going on in your buttocks area and spreading out down your leg, you might even feel it in your lower back. Hold this position for 15, 20 or 30 seconds (depending on how comfortable you are). You should repeat this exercise 2 – 4 times a day in cycles of 2 – 4 reps. This exercise is a little harder and a bit trickier than the first one so pay attention. As you can see, once again cross your legs, placing the ankle behind the opposite knee. Now wrap your hands around that knee and pull your leg toward the chest. You will feel a bit stronger stretching sensation along the buttock region and your upper leg. Exercise routine is the same as of the exercise above, hold the position for 15 – 30 seconds, repeat 2 – 4 times a day, 2 – 4 times per cycle. I highly advise you to go through the above exercises before going on to more advanced ones. The following exercise requires a little more flexibility and caution. As you can see on the images above, this exercise is no joke, you are stretching your Piriformis muscle along with other hip rotators using your whole body weight (and if you are a big guy like me, be careful). So how to get in this position? It`s not that difficult, just pay attention to my instructions: get in a pushup position then slide your right knee in line with your left shoulder, rotate your lower leg so your ankle is flat on the floor. Now, press your hips toward the ground and you will feel a deep, strong stretching in your right hip region. Hold this position for 30 – 60 seconds and then repeat on the other side. You can perform this exercise 3, 4 times a day. You will need a stool, 10-20 inches high. 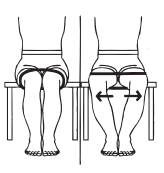 Place the heel of your injured leg to the stool and bend in the hips towards the stool. As you are stretching you will feel a slight stretch in the back of your thigh. Depending on your comfort level, hold the position for up to 30 seconds and repeat the exercise 4-5 times. This is yet another variation of the previous exercise and it is done like this: Assuming your left leg is affected, lie down on your back, bend your left leg in the hip and knee, grab your left knee with your left hand and grab the lower left leg with your right hand. Then start pulling the leg towards your right shoulder. Again, there is no need to overdo it, stretch it to your comfort zone. Sit down on the floor with your left leg straight, put your right ankle to the outside of the left knee, place your left hand on your left knee so that your left elbow is positioned on the outside of the right knee. I admit, the description may seem a bit confusing but there is a picture on the right which will help you get in the right position. Perform 5-10 repetition, two sets per day (hold the stretch for up to 10 seconds). Lie down on your back with your right ankle across the left leg. Place your hands on the right thigh and try to pull the knee inward. Perform 5-10 repetition, two sets per day (hold the stretch for up to 10 seconds). Consult the image to the left if you are having troubles getting into the right position. It sounds more complicated than it really is, don`t worry. So, rather than explaining how its done, I was able to find a video clip for you to watch. Even though this stretch appears simple and easy, it will do a great job of reducing the pressure on your nerves and lower back resulting in back pain alleviation. To begin lie down on your back and bring both your knees to your chest, hold the position with your hands and hold for about 10 seconds. Repeat 3-5 times. Just like with the exercise above, starting position is the same – seated, back straight, legs bent at 90 degrees in hips and knees. But this time you need to raise your affected leg and position the ankle over the opposite leg`s knee/thigh. Rest your arms onto your raised leg and bend forward. This is truly an awesome exercise, plus you can do it even when you are in the office, sitting in your chair. Hold the stretch for up to 30 seconds, repeat 4-5 times. This exercise is a bit more demanding and is best suited for those of you that are well physically fit. You will need to stand upright (it is best to find some sort of arm rest you can hold while getting into squat position), place your left ankle over the right knee and go into a squat. Obviously you don`t need to into a full squat, but try to make your thighs parallel to the ground. AS you start to lower your body, you will feel an intense stretch. Do 10-20 repetitions, or as much as you can based on your comfort level. One of the best and most recommended yoga poses for people suffering from Piriformis Syndrome is certainly the Pigeon pose. Below you will find a video by certified yoga instructor Cindy Mastry, demonstrating this pose. This pose will offer a wide range of benefits and it is perfect for beginners but it will also be beneficial to skilled yoga practitioners. It will open up your chest and improve the flexibility of the back spine and neck region. It will also relieve the symptoms of asthma, improve blood circulation, alleviate stress and depression. Watch the video below for bridge pose demonstration. Happy baby is yet another fantastic pose for stretching your lower back, hips, inner thighs and hamstrings. Keep in mind that you should avoid this position if you are suffering from hip or ankle injuries or if you are pregnant. The video below will demonstrate the proper way of practicing this pose. This is certainly an interesting pose which will test your flexibility to the max. But it is a great pose since it will not only improve the overall flexibility of your hip but also boost circulation in this region. Take a look at the video below and you will want to practice this pose each and every day! Locust pose might not influence your Piriformis muscle directly, but the goal of this pose is to strengthen your entire back, upper middle and lower, as well as arms and legs. It will also strengthen your chest, shoulders and abdominal muscles and improve your posture. And I add a small variation where I bend my torso so that I lower my head all the way to the floor and then I extend my arms in front of my head. This way you will hit the muscle and stretch it a bit further. Keep in mind that this pose might be problematic for those of you suffering from any sort of leg joint problems, which is why you need to use your common sense and avoid this pose if you feel it will hurt or put unbearable pressure to your joints. This pose is similar to the Longsit Piriformis stretch we mentioned earlier, but it will help you stretch your Piriformis muscle even more. Not only that, it will stimulate your internal organs and digestion and increase the spine`s elasticity and mobility. Check out the video demonstration below for a full overview. Revolved triangle pose is a fairly complicated yoga pose and if you are just a beginner, my advice to you is to get someone to help you – hold you if you start to lose balance, so you don`t fall down possibly injuring yourself. By practicing this pose you will give your spine a deep twist, improving its flexibility and mobility, as well as stretching your legs and alleviate Piriformis syndrome pain. Resisted hip stand is another exercise done with the help of an elastic band. 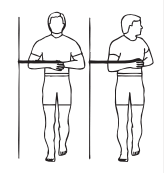 You need to stand upright, attach the band to a secured object to your side (at waist level), stand on the affected leg and rotate your trunk away from the band. Repeat 10-20 times per sets, to up to 3 sets per day. You will need an elastic band and a chair. Sit on your chair with your hips and knees bent at 90 degrees and feet resting on the ground. Next, attach the rubber band to a secure object at ankle level and loop it around your ankle. Now pull the ankle inward. You can do as much as 100 repetitions per set and perform one set every other day. For this exercise you need to, again, attach the elastic band at ankle level but you need to stand facing the pull and extend your leg backward with your knee straight. Repeat the exercise 10-20 times, 3 times per day. This exercise is a combination of the first two strengthening exercises we mentioned above. You will need to sit down, legs and knees at 90 degrees, feet flat on the floor. Next, place the elastic band around your knees and, while keeping the ankles together, try to spread the knees. Perform 10-20 repeats per set, 3-5 sets per day. 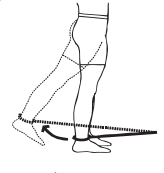 For this exercise you will need to stand in a sideways position, attach the rubber band at ankle level and pull the affected leg away from the center of the body. Do 10-15 repeats per set, 2-3 sets per day. I`m sure most of you already know what a partial curl is but it is important to do it properly, which is why I am about to go over each step of this exercise. First, you need to lie down on your back with your legs extended and your arms resting by your side. Now tighten your abdominal muscles and try to lift your shoulders off the ground and stretch your hands in front of you. Pay attention to lifting your shoulders, not just lifting your head. And once you lift your shoulders you can hold the position for couple seconds, then relax back to the starting position. Do 10 repetitions, 2 sets per day. Pay attention to this exercise ladies, it will do wonders for your rear ;) Unlike the previous exercise, the starting position for prone hip extension is lying down on your belly (you can place a pillow under you hips for comfort). Flex the leg at 90 degrees in the knee and bring the whole leg up, couple inches off the ground. Hold this position for up to 5 seconds and release. Do 2 sets of 10-20 repetitions each day. We can consider this a warm up for the two exercises we listed below. Basically, you will just need to get a foam roller, sit on it (position yourself so that the roller is roughly under your Piriformis muscle), extend your legs and roll back and forth. Now I know that some (if not most) of you don`t currently own a foam roller and are not sure as to what model you need to get. But don`t worry, we are going to help you find the right one. When buying a foam roller, you need to make sure it is the right size and firm enough to be able to really get to those tight muscles and loosen them up. So, to spare you the agony of looking for it yourself, we invested a bit of time and effort into finding the right one we could recommend. It is called The Grid foam roller. It is specially designed to for heavy, constant use and it even comes with a 1 year warranty. You can check it out at Amazon.com By Clicking Here. This is exactly the same exercise as the one we listed above with one crucial difference – this time you will place your foam roller so that it is parallel to your spine. Once you position it like this and sit on it, you will be able to hit the muscle at a slightly different angle. It is not a bad idea to try both these exercises and see which one suits you best; better yet, you can incorporate both of these exercises into your daily routine and you will see a massive improvement! This is it for now folks. But, if you have an exercise you haven`t seen in this overview and you found it helpful, you can either write it down as a comment down below or send it straight to our email and we will include it in the article once we update it. Take care everyone and let us know what exercise worked for you! Previous articleBruised Finger – Why It Happens And How To Treat It! Great resource. I would add trigger point release using a ball. Thanks for stopping by Juliet! We are actually planning on updating the article and adding a few more exercises (including trigger point release massage using a ball).